When Linda Blais went home after major surgery to return blood flow to her foot, she was in pain and dealing with a large wound that required special equipment to help her heal. "I thought it was the end of the world," said Linda. That all changed when VNA Care's home health team started visiting. VNA Care's nurse specialists include certified would, ostomy, and continence nurses (CWOCN), who have advanced education in the field and have completed a certification exam. The CWOCNs serve as a resource for patients as well as VNA Care's own staff when facing complex wounds, pressure ulcers, and much more. Linda was supported in her recovery at home by Carol Jones, RN, BSN, CWOCN, WOC Nurse team leader, and the home health care team. "Carol came in here and said, 'We're going to make you feel better,'" said Linda, a retired psychiatric nurse. Linda's surgery, known as a lower extremity revascularization, involved creating a bypass using her own veins taken from her arms and legs to restore blood flow to her foot. She returned home with a wound VAC, a device that decreases air pressure on a wound to promote faster healing, that was in an awkward spot and leaking. The wound dressings caused a burning sensation, and she was dealing with an infection. Carol kept her promise to Linda. (The two are pictured with Linda, left, and Carol, right.) Carol focused on managing Linda's pain and helping her significant wounds heal as quickly as possible. Carol worked with Linda's doctor to change the dressing to something more comfortable. She got the wound VAC under control and provided additional education and support to others involved in Linda's care. Carol taught Linda about nutrition that would support her recovery, made sure Linda had supplies and medications, and monitored her progress. "I have nothing but good things to say about the nurses," said Linda. "Carol is a true nurse. She really cares about her patients. She's a special person." After six weeks of care, Linda said she feels "almost 100% better." She's able to walk around her home and uses a cane when venturing outside. In the short-term, Linda looks forward to meeting her goal of taking her dog Coco for a walk around her apartment building. 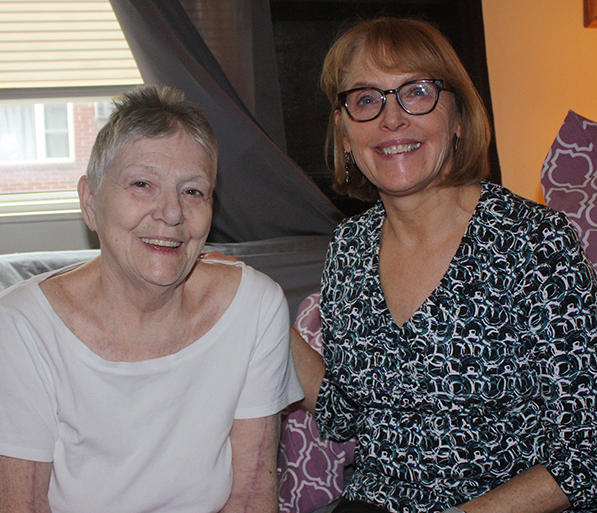 With Carol's support, Linda said, "I'm confident I will meet my goal." Longer term, the 73-year-old wants to return to riding a motorcycle, which she did until three years ago. Linda said, "I want to live my life. My goal is to ride a bike, even if it's a three-wheeler."